Manufacturer: Central Glass Products, Inc. This Beautiful Curved Glass coffee table is a perfect way to accent any modern home or office. 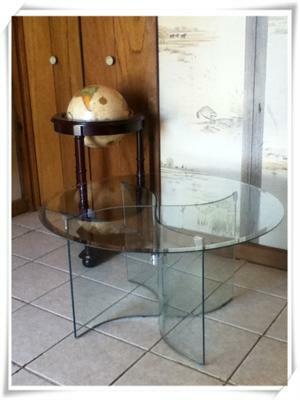 Featuring a 3/16" clear glass top, 35" Diameter with a 1" Bevel. The four base pieces are made of 3/8" clear glass with pencil polished edges. The Base is seperated from the top with (4) Elegant Shell Shaped Corner Cushions & in the middle with a Silver 4-way connector to connect the four legs together to form the base. The Table also comes with (8) of the non-slip grips for the bottom of the base for use on tile or hardwood floors. Dimensions: 35" Diameter Top x 19" High Weight: 50lbs. Magnificent Curved Glass w/Beveled Top Table!!! !